Finance is the heart and soul of every business. While small scale businesses’ financial circulation depend majorly on payment receipts and cash flow, big businesses have their own sources to maintain financial stability. Whether it is starting up a new business, or achieve faster growth with expansion, mergers or takeovers, getting funding from banks, ﬁnancial institutions, equity markets or investors is a must. 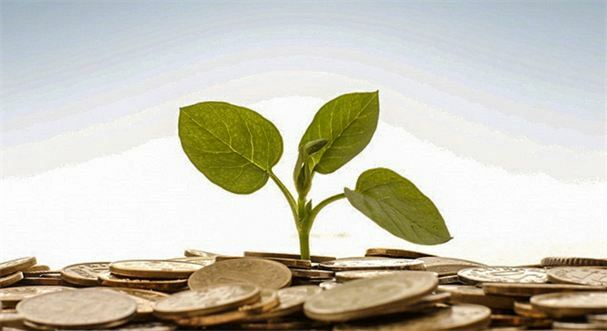 In the better interest of the business and to bring down the costs it is imperative that these funds be procured at lower rates of interest than the prevailing market rates. In all of these situations, application of Vastu attracts the right investor or support from ﬁnancial institutions and markets. ‘Vastu Shastra’ is one of the many great sciences that have come to us from the ‘Vedas’ or the knowledge books of India. ‘Shilpa Shastra’, or ‘Vastu Shastra’ as it is variously called is said to be an ‘Upa-Veda’ or a minor ‘Veda’. Also known as ‘Sthapatya Veda’ or ‘Sthapatya Shastra’, it is the applied knowledge of the ‘Atharva Veda’ just as ‘Ayurveda’ is attached to ‘Rigveda’, ‘Dhanurveda ‘to ‘Yajurveda’ and ‘Gandharva Veda to ‘Sam Veda’. You will be surprised to know that, originally, the learners of Vastu Shastra were also trained in ‘Artha Shastra’ (Economics). Major reason was to make them understand all the aspects related with; ﬁnance and use the balance of ﬁve elements to solve financial problems. Even, Chanakya the king-maker of ‘Maurya’ dynasty and author of ‘Artha Shastra’ used guidelines on directions of alchemy from Vastu Shastra. He has mentioned those guidelines for kings in his ‘Artha Shastra’. The interiors of each business relevant to its working needs and style can be made Vastu appropriate and Vastu compliant with innovative planning of work Space in terms of usage, flexibility and business values. Many in-house requirements of the company can be planned to obey the rules of Vastu (without compromising on the standards and ethics of the business) and contribute to the company’s growth and prosperity. Colors, lighting, ventilation, cabin doorways, cabin size, elevations within the cabin, furniture placement and orientation/location in addition to the primary five elements i.e. ‘Panchabhootas’. In Nature all five elements ‘Panchabhootas’ (Water, Fire, Earth, Air, and Space) are in balance. When a home or office is built that balance gets disrupted. Vastu is an ancient architectural science that balances the five elements in any environment bringing maximum productivity and success. (elevations, depressions etc.) can all add to the affluence or otherwise of the business. Imbalance of the primary elements may cause varied business problems. For instance account frauds leading to business loss is traced to the imbalance of the primary element ‘Agni’ or ‘Fire’. The North-East area of your home or offices is linked to the Water element and influences your success. The North-East is good for entrances, managerial offices, research and development. If this area has proper Vastu, finances will grow and there will be positive cash flow. If there is a toilet, clutter, heating or lighting systems, or blockage, growth will be slow. The South-East, which imparts the energy needed to complete transactions, is aligned with the Fire element. Kitchens, lunchrooms in offices, computer rooms, heating and lighting systems, and legal matters produce beneficial results in the South-East. When this area is utilized properly, there will be speedy transactions and profits. If there is a missing corner or blockage, transactions will be drawn out and investments will be sluggish. The South-West area of your office is associated with the Earth element and drives your financial support. A master bedroom in a home, offices for the chairman, directors, and supervisors of a business are most effective in the South-West. With proper Vastu in this direction, financial backing will come easily along with secure savings. If there is a toilet or heating source, there will be cash flow problems and depletion of savings. The North-West area of your office associated with the Air element. It influences the ability to create and communicate. Bathrooms, conference rooms, bookkeeping, and sales work well in the North-West. If this area is balanced according to Vastu principles there will be satisfied customers and clear communications. If there is a missing corner or blockage there will be inaccurate bookkeeping, dissatisfied customers, and confusion. The central area of a home or office is associated with the Space element. If this area is open there will be business and career opportunities. With clutter, toilets, a kitchen, or no open Space in the center of an environment, there will be financial limitations. According to Vastu Shastra there are 16 Vastu zones in every building. Each of them governs different aspects of your life. Out of them, North-West (NW) zone is primarily responsible for getting support from Financial Institutions. If there is a restroom/toilet in NW zone, you will feel there is nobody supporting your cause. Similarly, if there is green color which is creating an imbalance of ﬁve elements, then I your support system will not be stable and will face continuous problems. To ensure a healthy ﬁnancial support system, you must ensure the zone is clean of anti-elements and activities. Ideally, you can place a sculpture of a pair of white horses which symbolizes ﬁnancial support. This remedy will draw necessary support for your business from people, banks and other ﬁnancial institutions in the hour of need. Next is the zone of money and opportunities,North. If North zone has pantry or red or pink colors in your ofﬁce, you will face problems in payment recovery. You will also not receive new orders which form the back bone of ﬁnance for small and medium enterprises.Similar situation happens when there is blue color in South-East (SE) zone. In a scientific research conducted on over four thousand successful case studies, it has been found that placing some green plants gives miraculous results to relieve such situations. Similarly, if you have waste products (especially, metals) lying in East direction in your office or, factory, you will face problems with government departments and inﬂuential persons which will not be a good thing for your ﬁnancial growth. ln addition to these, you also need to take care of certain zones which help to create trust, vision, team, understanding and bonding, thus, supporting your ﬁnancial vision for growth. Once you have got your ofﬁce space programmed as per Vastu principles, you’ll get secure and fruitful ﬁnancial ﬂow in your business. The Chairman and the directors or CEOs occupy the Vastu appropriate areas: South, West and South-West and their subordinates the North-West or South-East areas. The direction to face receives prime importance. This is based on astrological signs. Wrong orientations will set blocks to your thinking process and hamper proper business decisions. Doors and the passages are an important consideration. 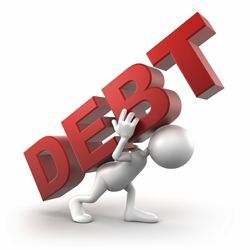 When these are improperly placed finances tend to get stifled and suffocated. Furniture and fixtures, electrical and electronic gadgets and treasure rooms have all to be based on their relevance with the primary elements. 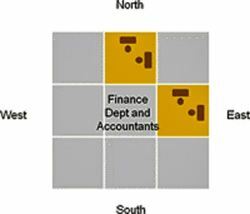 The Finance head, the Chief Accountant and his staff have to be in the North and East sectors. Financial records, cash and other assets have to be either in the central North or South-West of the cabin. Staff dealing with cash and bank transactions face North and East directions. ‘navagraha mantras’, particularly of Jupiter ‘mantra’ will help you to take the right financial decisions and possibly pull you out of the debt trap. To stimulate financial growth in your life place a water fountain in the North-East area of your home or office. Fountains are very effective in moving the ‘stuck’ energy, especially when it comes to finances. Water symbolizes purity and enlivens all living things. Our bodies are made up of 70% water. We can live for quite some time without food, but we cannot survive very long without water. Fountains with moving water enhance life-supporting energy. Fountains cleanse and absorb negative energy. They polarize light, creating ultraviolet light with ozone, which enhances all growth. The Earth is a magnetic force and is composed of the five elements, as is our brain. The thalamus is the relay center for all sensory and motor skills in the brain. Neurological research has shown that the firing patterns of neurons in the thalamus function differently depending on which direction one is facing. Our mind is then the interactive result of the effect of the magnetic field on our brain cells. By placing our bodies and environments in alignment with the magnetic axis, we can think and act more in tune with Nature. As a part of this Earth, we live in a sea of electromagnetic and stellar influences. Every shift produced in the atmosphere has the potential to affect our actions. Every particle of energy in the atmosphere is linked to the next particle. According to Vastu, the Sun produces different qualities of energy on its path from East to West and can influence our daily life. Each of the five elements is associated with a direction and each direction has a particular influence on our business activities. Each function of a business is most optimally supported by an individual direction. Our actions will be more synchronized with the forces of Nature, much like swimming with the stream as opposed to swimming against it. Many studies have shown that when one faces North at their desk they will be more productive and successful. Studies have also shown that sales increase when a sales person faces North or East when working with a customer. Unfortunately most modern architecture is based on function alone and is not designed to obey the forces of Mother Nature: the Sun, Air, Water, Climate changes, and the Planets. All ingredients of a business, whether home or office based, are greatly enhanced when the functions mentioned above are in their proper position. If there is imbalance, these can be corrected by a qualified Vastu professional who is experienced in rectifying pre-existing buildings. There should be no obstacle placed near or in front of the doors of the office. The central part of the office should be kept empty. Reception should be preferably located in the North-Eastern part of the office. The receptionist should face either the East or North direction. Water bodies must be placed in the North East or Eastern region. An aquarium with 9 gold fishes and 1 black fish is recommended in the North-East is an advisable idea for Vastu for office interiors. 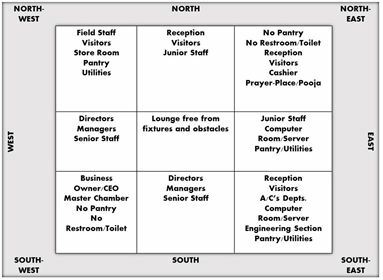 Executives, managers and directors should be located in the West, South or South-West areas of the office according to office Vastu. Eastern and Northern zones should be reserved for the middle level management and employees. Field staff should be located in the North-West. Vastu tips recommend that the staff work facing the North or the East directions. Office Vastu recommends that the accounts department be located in the South-Eastern portion. Marketing department should be in the North-West of the office design. Try to avoid seating any employees under the beams. If this is unavoidable, cover the beams with a false ceiling. Office Vastu suggests that the owner or MD should have a rectangular table. Pantry and lunch rooms should be located in the South-East and North-West according to Vastu tips. Restrooms should be located in the North-West corner of the building or in the North-West corner of the rooms. Other alternative directions for restrooms are Central-South or Central West. Restrooms should be avoided in North-East, North and East. All important documents and papers should be stored in safes and cupboards that face the South-West direction. All side tables and telephones should be placed in the South-West corner. Conference rooms are best placed in the North-West direction. Employees who need to improve their performance should first be located in the Western region and then shifted to the South-East. Placing images of Gods and deities towards the right of mirrors is considered auspicious from a financial point of view. The staircase is best located in the South, West and South-West locations in the office design. If the office has a temple, it should be placed in the North-East portion of the office design. These Vastu tips are designed to draw from natural elements and improve energy levels in the working environment. The Vastu for office construction involves many more parameters, but this can be used as a yardstick for small changes.